As the setting is in space we thought we should use comets as special tiles. But what exactly will they do? We thought about what real comets do and came up with the idea that our comets should destroy other tiles. Since the normal tiles can be easily destroyed anayway, we were in need of some permanent tiles that remain in place even after you have walked on it. If you now walk onto a comet tile, the corresponding permanent tiles will disappear. With this element it is not so clear when you have to pick up which light tile. Once again they come in different colors to confuse you more. It took a long time to find a design for the permanent tiles that we all like. The first idea was to make a rock-like tile with a crack through which a colorful glow shines. 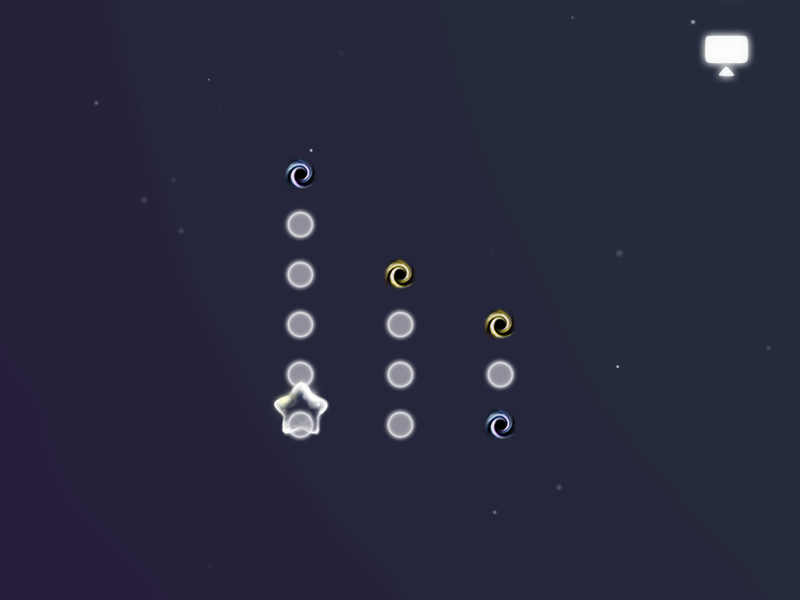 It is supposed to look solid in contrast to the normal tiles, but at the same time destroyable by the comets. They look simple and elegant. But it is not quite our style. Finally, we found a variation of the original idea that just falls into place! The rotatated position should help especially color-blind players to be able to distinguish between them. We really enjoy this exciting element! Hopefully you too. This entry was posted on December 31, 2012, in Special Tiles. These are our favourite tiles! And the most challenging, if you ask me. Some filthy pig left his waste in space – rockets. But hey, that’s great! 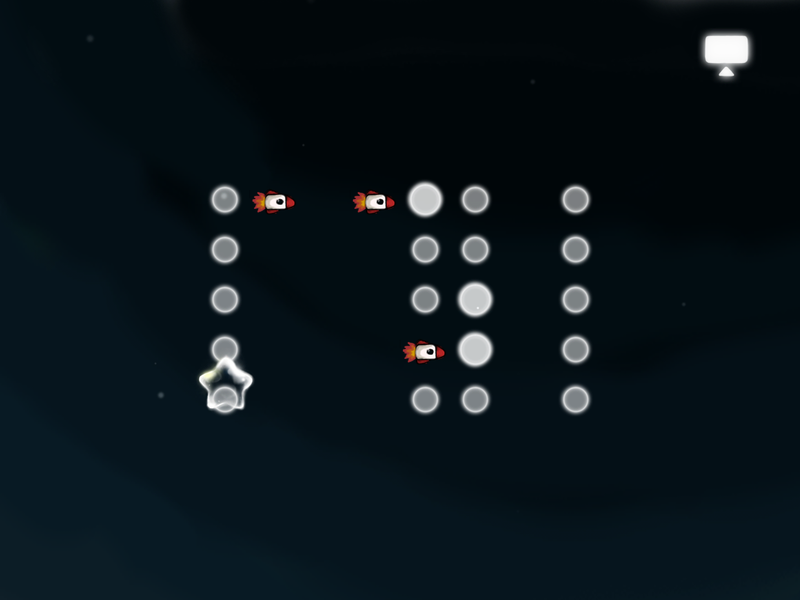 Our little star can use them to fly over huge distances between two tiles. And just like that he is flying through the sky. So what is the difficulty? You can now cover large distances and do not have to clear one block in one motion. There might be the possibility to come back to this block again with a rocket. Now we had to think about the exact function of these rockets. Finally we agreed on these rules: rockets jump over other rockets because they just fly above them. But they land on every other tile including the other special tiles. If this is a wormhole then the star will just be sucked into it. This entry was posted on December 16, 2012, in Special Tiles. The wormhole is a common game element. It teleports you to another position anywhere on the screen. That is the first element to make the solutions less obvious for the player. It also gives the game a more colourful look. Additionally, we can use several wormholes in different colours to irritate the user. But it was a long way until we finally agreed on a design for the wormholes. Here are some examples of the things we tried out. We hope you like the final decision.